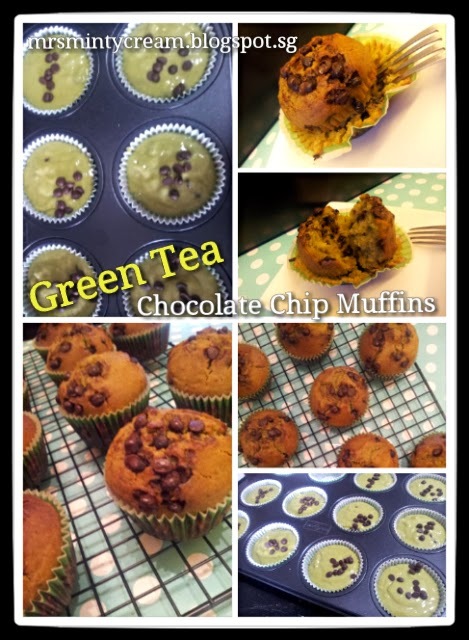 I have never been a great fan of green tea items (other than sweetened green tea which really isn't much of a green product anyway) so when bff suggested baking some green tea muffins, I was actually glad to give it a try. I know that if she hadn't suggested it, I would probably not try out much green tea recipe due to my lack of interest in this ingredient. Thanks for the suggestion! For the muffins, I must say that they turned out tasting better than I thought they would. 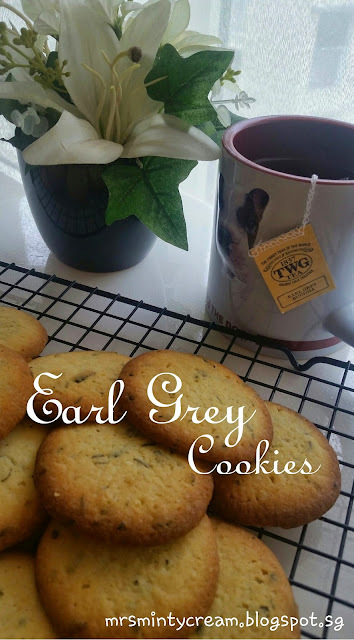 It was soft and sweet and the green tea flavour was rather subtle, which really cater to my liking. Not to mentioned, the yummy chocolate chips brought the taste up a level! (1) For green tea lover, you should increase the amount of green tea to 2 or 3 tbsp instead, depending on your preference. (2) To prevent the muffins from sticking to the paper liners, you may either omit the use of paper liners or substitute 95ml of vegetable oil with 50g of butter and 45ml of vegetable oil instead. 2. Sieve the dry ingredients (flour, green tea powder, baking powder and salt) together and set aside. 4. In a mixing bowl, beat in an egg until it is pale. Add in sugar and vanilla extract. Whisk these ingredients together using a whisk until the mixture is light-coloured. 5. Add in vegetable oil, yogurt and milk and whisk them together until they are well combined and a thick mixture is obtained. 6. Combined the wet ingredients in Step (5) to the dry ingredients in Step (2). Make a well in the dry ingredients and slowly pour in the wet ingredients into the well. Fold in the flour mixture slowly using a spatula until the combined mixture is well-mixed, with no trace of flour. Be careful not to over mix the batter. 7. Finally, fold in the chocolate chips into the mixture using a spatula. 8. Using an ice-cream scoop, divide the batter evenly into 10 muffins cups. Each muffin cup should be filled up to 2/3 of the way. 9. Tap muffin tray on tabletop and shake it gently to ensure that the batter is level and evenly spread out. This also help to make sure that any excess air is removed from the batter. 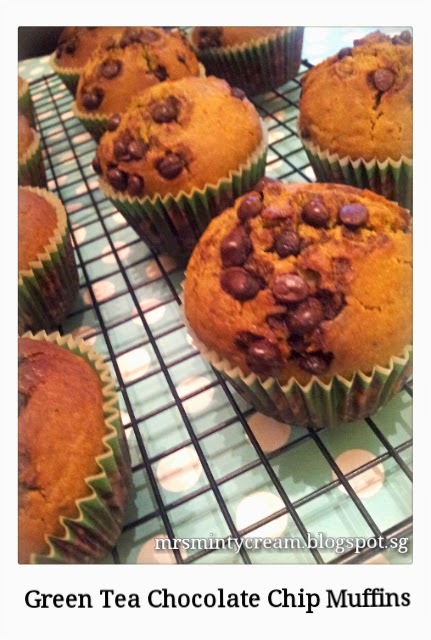 You may then sprinkle some chocolate chips on each muffin cups before baking them in the oven (optional). 10. Bake for 20 minutes (turn the muffin tray front-to-back after 10 minutes) or until the top of the muffins become golden brown and toothpick when inserted comes out clean. Remove muffins from oven and cool in muffin tins for 5 minutes before transferring to wire rack to allow them to cool completely. 11. You may want to dust the muffins with green tea powder or frost the muffins with green tea whipped cream before serving (optional).